First up, sorry for the lack of updates this week, work has kept me away from the blog, a situation that will be resolved soon. However, in the course of my web browsing recently, there have been a few gems tucked away in the blogs and local media you may not have noticed. First up, Butts resident, ace letter-writer and occasional blogger The Mushroom cuts through the spin of the recent closure of the play facility in the Butts. Walsall Council trumpeted this as some great community achievement, whilst neglecting to mention that they were removing a facility put in place at no small expense only months earlier. This has also been covered by The Plastic Hippo in his usual, inimitable style. Only in Walsall could such a dismal performance be heralded as listening to the the community. Secondly, largely unnoticed by the main local media, there’s been a bit of an upset in the by election for Bloxwich West, held last Thursday. The election was brought about by the sad and sudden death of former Mayor, Councillor Melvyn Pitt, and against the apparent evidence, the Conservatives were handed a decisive defeat by Labour candidate and campaigner Fred Westley, who won with a majority of 342 votes. The Liberal Democrat candidate came fourth, behind the not even faintly ridiculous or comedic UKIP, with just 71 votes. There’s a whole bunch of coverage over on the YamYam, from great sites like The Bloxidge Tallygraph and even The Stirrer. The sad old Express & Star, however, buried the story in it’s printed edition, presumable because it didn’t fit in with their new aspiration to become Ministry of Truth for the coalition. 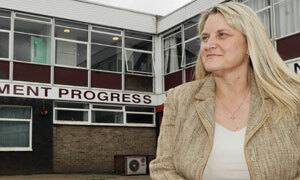 Head Jaqui Grace at the crumbling Frank F Harrison school, from the Birmingham Post. Thirdly, as was widely predicted, wave goodbye to Bryntisilio and Willenhall Leisure Centre. Attempts to pull the deal in for scrutiny by opponents of the closures predictably failed, and there’s acres of coverage pulled together at the essential Walsall news site, The YamYam. 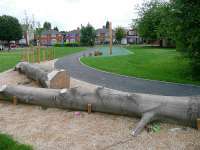 Despite Walsall’s appalling record for obesity and public health, our council see fit to close facilities that provide both outdoor experience and exercise to young and old alike. One wonders where cuts will be felt next, as the Council’s enthusiasm for the gratuitous and frankly nasty social engineering currently emanating from Whitehall seems unbridled. Virtually silent on the Building Schools for the Future fiasco, council leader Mike Bird is clearly hoping that as a consequence, we’ll all soon all be to ill and stupid to protest. Finally, I’d like to point out some blogs of interest I’ve spotted along the way. Recently I’ve been particularly impressed with the blog ‘Pheasey Views‘ by resident Ian Robathan, who can be found on twatter also. It’s nice to see people committed to their area and interests, like TronsterUK from over the A5 up in Burntwood who’s just started blogging about his technology and Tae Kwon Do interests. He’s fun on twatter and his blog is certain to be enjoyable and informative. Blogs by Chas Mason, the Clayhanger birder, and Chasewaterstuff, the rail enthusiast and historian continue to surprise and delight. The Stymaster is still ranting beautifully, and the Bloxidge Tallygraph is the yardstick by which we continue to all be judged. This entry was posted in Chasewater, Environment, Events, Express & Star, Followups, It makes me mad!, Just plain daft, Local History, Local media, Local politics, Shared media, Spotted whilst browsing the web, Walsall Council, Walsall Wood stuff and tagged Bloxwich West by election, Brytysilio, BSF, Building Schools for the Future, Chas Mason, Chasewaterstuff, Closed play facility, Express & Star, Fred Westley, Ian Robathan, local blogs, Local politics, Melvyn Pitt, Mike Bird, Pheasey Views, Politics, Redevelopment, The Bloxidge Tallygraph, The Butts, The Mushroom, The Plastic Hippo, The Stirrer, The Stymaster, The YamYam, TronsterUK, Vandalism, Walsall, Walsall Council, Walsall politics, Walsall Wood, Willenhall Leisure Centre. Bookmark the permalink. thanks for the heads up Bob, will cross reference the article on the Pheasey blog, little happening round here recently !! Reality distortion also includes statements about money. Have a look at the financial out turn for 09/10 at weds cabinet. Is the surplus on the table in that paper 13 million?